I was 37 weeks pregnant and settling into our new life in Berlin, when we decided that before the baby arrives, we better squeeze in our last nature getaway sand junior. Since we don't have a car, we looked for someplace reachable by train and lo and behold found Spreewald, a UNESCO Biosphere Reserve located only one hour from Berlin. Spreewald is known for its 1500 kilometers of streams that come out of the Spree river and cut through picturesque forests, wetlands, fields and historic Venice-like villages accessible only by water. The whole place is basically a giant water maze. Even though the reserve is most popular in the summer, we've had great experience traveling to places off season, so we decided to give Spreewald a try on an early November weekend. At first, Mr tried to convince me that we should bike. But as adventurous as I'd like to think I am, there was no way I was getting on two wheels with my giant belly. In fact, to my pregnant self the boat tour seemed like the ideal way to go. 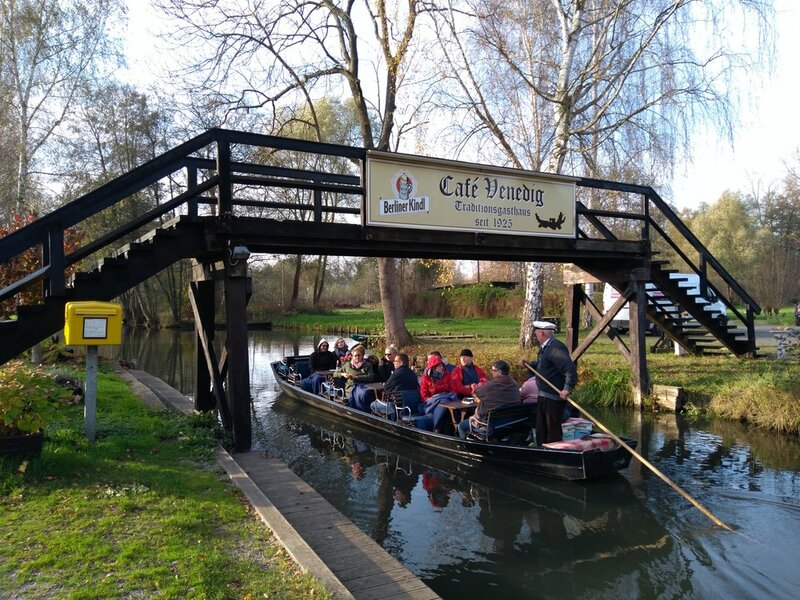 However, once we made it to the little port of the town of Lübbenau where we were staying and saw the next departing boat, we realized that since we came to Spreewald to get some couple time before our family expansion, spending 2 hours on a boat with a dozen gluhwine-drinking passengers wasn't exactly ideal. And so, hiking it was. It wasn't the best way to cover a lot of ground or enjoy the water, but it seemed like the only option, so we picked a direction and headed out of Lübbenau toward the marshes. But before we got very far, we spotted two red kayaks floating toward us. Bingo! Kayaking was exactly what we needed - we'd be alone, we'd cover a lot of distance and we'd be able to see this water world from the water. Funny enough, even though Mr. and I had traveled to many water-bound places, we had never kayaked together. In fact, I was under the impression that Mr. wasn't a fan of the paddle sport (some awful experience way long ago, I'm sure). But I loved the idea and he was wise enough to agree to the whims of his very pregnant wife. So, kayaking we went. Turns out kayaking is actually the perfect activity for the extremely pregnant. I could paddle whenever I felt like exercising and I could just sit and have my own private gondolier paddle us around the streams. The area was gorgeous! We lucked out with the weather as the day was crisp and sunny and the late autumn light made the streams and marshes look magical. Best of all, for most of our 3-hour water ride, there was no one else in sight. After we returned the boat, we explored Lubbenau's cute shops, restaurants and an abundance of well-fed local cats. All in all, it was the perfect getaway - quiet, easy to get to and with just enough to do for a two-night stay. When the baby arrived a week early, I was especially glad we got a chance to get out of Berlin and do some nature-time by ourselves. I'm pretty sure we'll need to wait quite a while until we're able to kayak with the little one. May 7 We're on House Hunters International! Jul 21 We're in the New York Times!